everyone should come to the D AI Y event in Shibuya on saturday (30th) where i play live at 19:00. it continues on sunday, but on sunday (31st) i have another gig, also in tokyo, in TOTOSK CAFE. come to both gigs, they're gonna be great! i will post a sample of a new song EVERY WEEK from now, so be sure to check back. autumn is definitely here, and i've barely been outside the door today. i'm working with the arrangements and sound of my new songs, and will soon be able to introduce some samples here. on a day like this, i like to watch photos of a warm day. not far from here, there's a great park called Rinshi no Mori, which Tae told me about, and we've also went there together. last week i took some photos, and want to take the opportunity to share this park with you. Rinshi no Mori is a place for catching your breath and finding inspiration. yes, it's like 10 turtles on the fallen tree in the pond, enjoying the sun. i'll be trying out the service of bandcamp, as a replacement of my myspace page. no ads, no annoying menus. just free streaming of full songs. i have to upload one song at the time, entering metadata, so it will take some time to get all my songs up, but they will be! i've started with my 2-track digital ep from last year. please listen, share it with your friends, and please enjoy! after 3 years of sweating and swearing over myspace, it's time to abandon it. myspace is bad, slow, user-UN-friendly and exploits indie artists. we upload our music and.... get no share in the million dollar revenues from the horrible ads. we can't even choose which ads to display. the music is the BAIT to make people come. indie musicians are like worms on a hook for the myspace crew and it's big-corporation owners. those are some of the reasons that i have decided to leave myspace. my songs will still be there until they are available somewhere else. in a better place, in a friendlier space. myspace gave me 3,5 years of trouble and headaches. it will never become what it claims to be. myspace is a fake. after my interview and performance in radio J-Wave last week, i was invited to perform at the D♥Y event which takes place in shibuya, tokyo, on october 30-31.
i'll update with details as soon as i know. please come back for details. during 2009 and early 2010 i co-produced the debut CD of swedish singer and songwriter KATARINA GOTTFRIDSSON. the album is now released in sweden. "kvar p� jorden" (left on earth) is 10 songs in swedish, recorded in katarina's house on �land, the long narrow island outside sweden's southeast coast, and we also used some studios in stockholm for the trumpet, trombone and percussion parts. i'm looking forward to receiving a copy of the digipak CD, which i also helped design. you can order it from her website, just send an email. saturday night's live performance in CLUB ROOTS, koenji, went really really well. i was in top shape, and the audience was very warm & receptive, laughed, danced and..... cried.... ? why do people cry when i sing live? anyway, it was a great night! 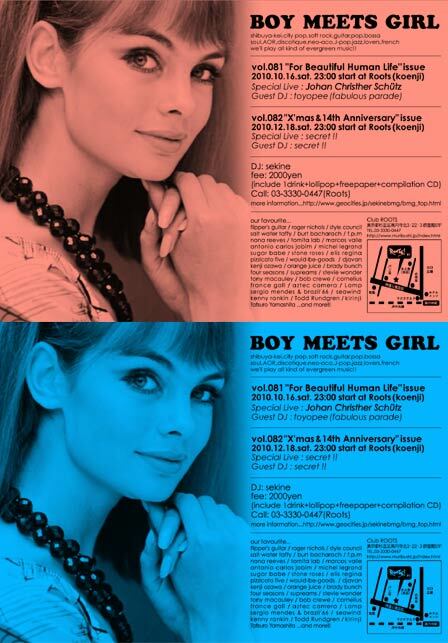 thank you Sekine-san and Yukimi-chan, and good luck on december's 14th anniversary BOY MEETS GIRL event! 14 years! that's really something! some people from the audience that stayed until the end. thank you everyone! hope to see you all again! frequently there are annoying SPAM comments added to this page, so i decided to take away the COMMENT function at this moment. i will re-introduce it later, but right now, i don't have the time (and interest) to clean this place up all the time. tomorrow (10/16) i'll play live in Koenji, Tokyo. i'll do 2 sets, totally about 20 songs, between the great DJ sets by Sekine and Toyopee (fabulous parade). this is set to be a great night! with top DJs only playing evergreens and my live performance, you can't miss it!